Exactly one month and one day ago one of the members from Ratanooga Forums blessed me with a little black baby girl rat. I decided to name her Winry Rockbell. Winry is growing up to be real champion. She's by far the most playful rat I've ever met and she absolutely loves being around other rats and people alike. What has been even more astonishing is how she's stolen my Dima's heart. Dima is normally an extremely dominant, bully type rat when it comes to other rats, but a lover of people. But from the moment Winry set foot in their cage Dima's been a changed man-rat. Now he's all cuddly and playful and loving! I guess that's just what cute, chubby little black rat will do to a person! Here's a pic of Winry squished in between the boys. Disya on the left, and Dima on the right. It seems that as of late my posts have been fairly depressing. I'm very sad to report that we have lost yet another one of our special rats. Ribbi passed on peacefully in his sleep on Sunday morning. It seemed that in the last few weeks after Bobby's death Ribbi was just depressed. In the last few days he started refusing his medication, forcing me to become very creative in getting anti-biotics into him. We went to the vet, after x-rays and tests we couldn't find anything wrong with him. Our conclusion was that he was just too old for his little body to carry on. He joined his brothers on 27 June 2010 at approximately 5h30am. Rest in Peace my little angel rat, I will always miss that naughty twinkle in your eye, the holes in my favourite pair of jeans will always remind me of you! Part of the responsibility of owning pets is to know when it's time to say goodbye, when it's best for them, even though it hurts for us. On Saturday we had to make this very difficult decision with my little heart-rat, Bobby. He had been ill for several weeks and although he was coping somewhat with medication, he was not getting better. I had made the mistake before of allowing the suffering to continue in a last ditch attempt to have my little rat with me when James was sick in April, and I thoroughly regret doing that, he suffered in ways that I never wanted to see and I definately did not want the situation to repeat itself with Bobby. So we contacted our trusted vet, who cried with us as Bobby slipped away. Bobby was burried next to his brother, James, in our garden, and he will always be remembered as the rat who stole every one's hearts. Introducing adult rats have always been tricky but for some reason I’ve always been blessed with rats that accept their brothers (and sister) with relative ease. That is, until I brought Disya and Dima home in April! I originally got them as companions for my aging heart-rat, Bobby, after he lost his brother James. A lot of rat owners will tell you that the Siamese gene tends to be very dominant, and with Disya and Dima both being Siamese I was weary but not too concerned of their tendency for aggression. Dima quickly proved that I was overconfident in my knowledge of rats and unfortunately Bobby suffered the brunt of his dominance and we almost lost him. Both Disya and Dima were promptly neutered the next week and we’ve been waiting patiently to introduce them to our little girl, Lily, who is incidentally also a Siamese and has given her poor cage mate, Ribbi all his days with her bundles of energy. We’ve been slowly starting with introductions, putting her cage close to theirs and swapping toys and blankets to get them used to each other’s smell over a period of a few weeks, while waiting for the boys to “dry up”. On Saturday we officially introduced the three. Lily was ecstatic to meet new friends (as usual)! She was running up and down the bed, squirming underneath the bigger rats and dashing under and out of their blanket in a general state of exploding energy. Poor Disya and Dima didn’t know what hit them! This little whirlwind was so fast they could hardly see her, let alone keep up with her! I was laughing hysterically as Disya tried to play with her but looked like a lumbering giant trying to keep pace with her as she would run away from him. Dima was caught a bit off guard and retreated to mom’s lap for pretty much the first half of play time, trying to avoid Lily. She quickly stole his heart though and they were grooming each other after no time! We repeated the exercise on Sunday and added in some yummy spaghetti and sweet potato for dinner (I maintain that the best way to build relationships is over a meal). This time around Dima even seemed happy to see his new sister and they were wrestling and grooming for hours! I didn’t once see the aggression that was present with Bobby at playtime so I felt very positive about this. Lily and the Twins will continue to have playtime together for the next week or so and should soon be able to join each other full-time! Making a difference in the lives of animals in SA has been a dream of mine since the day my parents got DSTV and I was introduced to Animal Cops on Animal Planet. My husband thinks I’m nuts and most of my friends put up with me, hoping it’s a phase I’m going through, but what can I say… Helping to start up RIA is a realization of that dream! How I got into rats is an interesting story, to say the least, and as I look back on it I realize that I made several mistakes as I went along. But my intentions were sincere, which is why RIA is such an important organization. People with sincere intentions make critical mistakes if they’re not informed. Any way, Bobby came into my life because of my little corn-snake boy, Whiskey. At the time I got Whiskey I was unable to find frozen food for him in my area, which resulted in my then boyfriend feeding him live pinky mice. As much as I loved my new snake, I hated the thought of killing such an adorable little animal for him. My boyfriend would come home with one or two little pinkies and Whiskey would never see them because I attempted to save them by hand-rearing them. Unfortunately, this never worked, and I could kick myself for continuing to try! But eventually I got sick and tired of my failures and decided to try a slightly bigger animal, a rat named Bobby. I got Bobby just after his eyes had opened; I estimated his age at 3 weeks and fed him puppy formula for a few weeks. But there were a few things wrong with my approach to his care back then. Bobby was completely infested with mites when I got him, but because of my ignorance and lack of research I assumed the growths on his ears were due to extensive inbreeding by the pet shop. I also kept him in a smallish budgie cage, on pine shavings and fed him a sunflower based food. I carried on like this for several months, and only now do I see the effects of the damage I did then, but that story will be kept for a later entry. Eventually my boyfriend stumbled upon Ratanooga and I got completely hooked on learning more about these little critters and was completely entangled in the community. 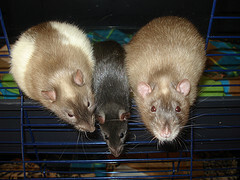 So getting involved with a forum such as theirs is something I highly recommend for any potential rat owners. My other fur-kids include Lily, my first and only girl, a Sable Siamese, Ribbi, a big agouti sweetheart, and the twins, Disya and Dima, Disya is a Siamese hooded and Dima is a very big sable Siamese boy. In the last 6 months I’ve had to say goodbye to three of my ratties, something that still breaks my heart today. They are Captain, James and Sven. I fully intend to share the lives of my ratlings with you here, hoping that there may be something you can learn from what I’ve experienced, and what I continue to learn on a daily basis! Michelle has kept rats for the last 3 years. She has since developed a keen interest in their health care and as a result is currently studying towards her NDip in Animal Health.